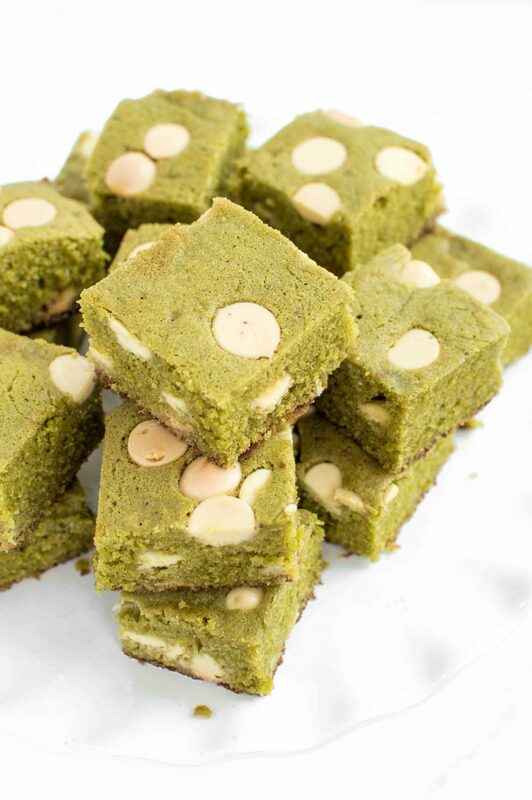 Green Eggs and Ham comes to mind with this recipe from blog Chocolate + Connie, which combines the star power of matcha and white chocolate to make unique green and white brownies. Flour, matcha powder, and melted white chocolate mix with milk, butter, sugar, and eggs to make the batter. White Chocolate chips add an extra dose of sweet texture to these yummy treats. Would you eat them in a house? Would you eat them with a mouse? Would you eat them after dinner? We think yes, ‘cause they’re a winner. Hibiscus tea infuses butter to kick off this recipe from Sprinkle Bakes. Start by heating unsalted butter in a saucepan and add hibiscus tea leaves, turning your butter a lovely shade of reddish pink. Pour this red mixture through a sieve and tea towel into a bowl. Cool the mixture in the refrigerator until it’s somewhat firm. Then combine it with sugar, vanilla, flour water, salt, and poppy seeds to make non-sticky dough. Pop the dough in the fridge for 30 minutes, then roll it out and cut into whatever shapes your heart desires. Transfer your shapes in the oven, and then prepare your taste buds for a scrumptious batch of shortbread cookies. It’s pretty common to chase a hunk of pie down with a cup of tea. Why not put tea in the pie? That’s just what this Sweet Tea Pie recipe from Tasting Table does. The filling includes two orange pekoe (black) tea bags’ worth of tea, along with cornmeal, butter, eggs, sugar and flower. Sweet tea is a staple of the South, but we think this pie will resonate with taste buds from sea to shining sea. Jasmine tea makes these cookies from Martha Stewart stand out. The jasmine “lends a sweet, floral balance to the tart grapefruit-curd filling,” according to domestic guru’s site. The jasmine tea blends with butter, sugar, vanilla, flour, and salt to make shortbread dough, which is then baked into cookies that sandwich a delectable sour grapefruit filling. This recipe takes over 4 hours, but it’s sure to provide you with a unique, tasty treat and bragging rights for days. The basic flavors of chai—cinnamon and cardamom—are a perfect candidate for your sweet-tooth post-dinner needs. And these chai shortbread cookies with chocolate and sea salt from Foodie Crush fire on all cylinders. Simply adding a tablespoon of fine ground chai tea to shortbread batter infuses the dough with auspicious notes of chai. Once the cookies are baked, dip them in chocolate chip ganache and sprinkle them with sea salt for a finish that adds extra flavor, texture, and a definite “WOW” factor.